Express your American pride with patriotic gifts, and get ready to celebrate America’s Independence Day this 4th of July! Not only that, but you have time to personalize the gift and make it even more special. GiftsForYouNow.com has many patriotic gift ideas to choose from, and we’ve selected some that we think will make this holiday more of a fun event. 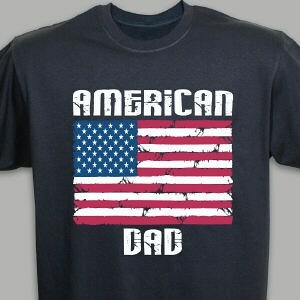 Let’s start with a good ‘ole T-shirt for dad that says “American Dad” on it with an image of an American flag! There’s actually many patriotic T-shirts, and you can browse around their site for more choices. Then, what goes better with a t-shirt than a good ‘ole patriotic hat? 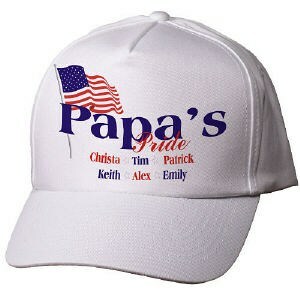 This one says “Papa” on it, but again, there are many other hat choices on the site. And, what about your patriotic grandpa? 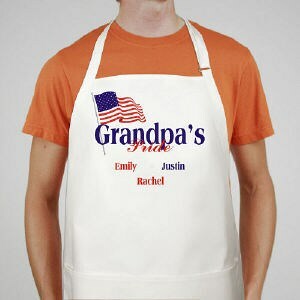 Here’s an apron for that grandpa who likes to cook, or who just might be assigned to barbecue duty on the 4th! While not everyone thinks of decorating for the 4th of July holiday, many people do. So, let’s bring out the welcome mat for those who are expecting company that day! 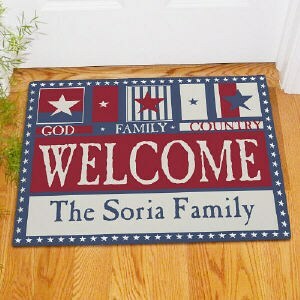 These personalized welcome mats come in a variety of mat design choices, so again, browse around to find the one you like best. 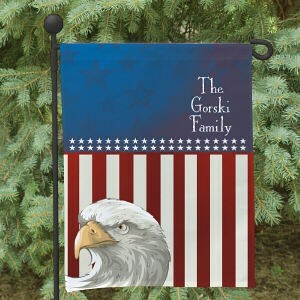 While you’re doing that holiday decorating, put out a traditional garden flag, like this one. These garden flags come personalized, adding that special touch to your outdoor scenery. There are a lot of personalized patriotic gift ideas, and we hope this helps you in your plans for making this 4th of July a special event!